After reading this comic of the day you may think to yourself (as opposed to thinking to someone else), "I like this comic book. I want to get Franken-Castle #17." Well, good luck. You won't be finding a Franken-Castle #16 because Franken-Castle #17 is the first issue in the comics titled Franken-Castle...Franken-Castle, Franken-Castle, Franken-Castle! The comic book formerly titled The Punisher has gone into a distinctively different direction than Punisher books of the past. The comic has a bit of a horror aspect to it and sports a half-man half-machine Frank Castle whom is suped-up with unnatural power, something the Punisher has always been void of. He is literally Frank the Tank. While I am a fan of the new direction involving the super-natural Punisher, others have dropped the book and switched to the Punisher Max series in search for a grittier more conventional and real world Frank Castle. 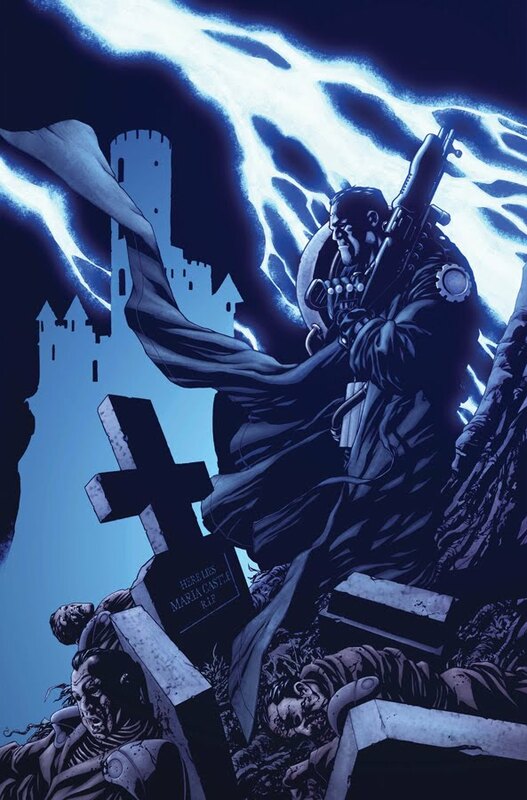 The change in name of the Punisher comic could be a way for Marvel to help distinguish the difference between Frank Castle worlds. Now, when a reader stops in a comic shop to get a Punisher title they will find a Punisher to their liking.